Can’t get enough of movies like Maze Runner: The Death Cure? I know after I watched the first two I went on a binge of dystopian movies myself! Check out 10 movies that I watch when I’m craving that “foreboding future” feeling! Maze Runner: The Death Cure is an upcoming action, dystopian, sci-fi, thriller movie that is set to be released in theaters on January 26, 2018. It is the 3rd and final installment in the Maze Runner movie series- preceded by the 2014 movie- The Maze Runner and the 2015 movie- Maze Runner: The Scorch Trials. 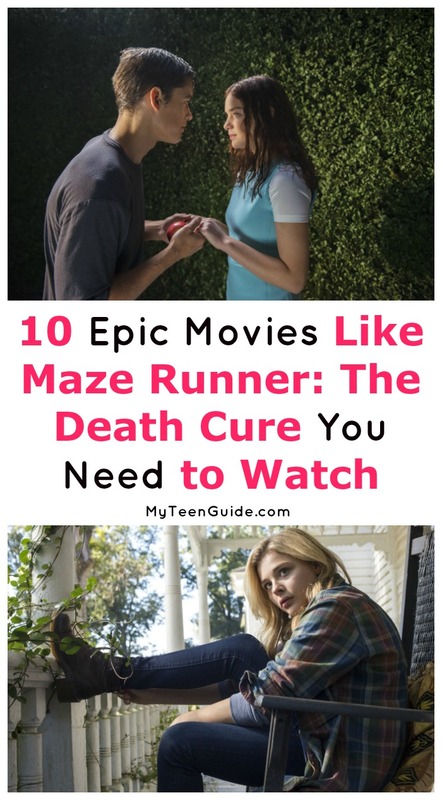 Here are some great movies for you to watch like Maze Runner: The Death Cure. Love this series? Throw the ultimate Maze Runner movie party with these tips! Cube Zero is a 2004 sci-fi, psychological, horror, thriller movie that is the prequel to the 1997 movie- Cube and the 2002 movie- Cube 2: Hypercube. A political demonstrator, Cassandra Rains, is trapped inside the Cube, but gets help to escape, by a Junior Cube Technician, Eric Wynn. Cube Zero stars Stephanie Moore and Zachary Bennett. The Village is a 2004 psychological, horror movie. Residents of a small, isolated village, live in constant fear of creatures who live in the woods that surround the village. The Village has an all-star cast, including Bryce Dallas Howard, Adrien Brody, Joaquin Phoenix, William Hurt and Sigourney Weaver. The ending is the best part! Even though you kind of see it coming, it’s always nice to have your predictions validated! The Island is a 2005 sci-fi, thriller movie. Lincoln Six Echo and Jordan Two Delta are among the residents of a futuristic, sterile compound, who soon discover that their lives may be one big lie. Their only goal in life: get chosen to go to the pristine island, the last uncontaminated spot on the planet. Like all dreams in dystopian worlds, though, you have to be careful what you wish for! The Island stars Ewan McGregor and Scarlett Johansson. The Hunger Games is a 2012 post-apocalyptic, action, adventure, sci-fi movie that is based on the 2008 novel, of the same name, by Suzanne Collins. It is the first movie, in a series of 4, followed by The Hunger Games: Catching Fire in 2013, The Hunger Games: Mockingjay- Part 1 in 2014 and The Hunger Games: Mockingjay- Part 2 in 2015. In the nation of Panem, two teenagers from each of its 12 districts, are forced to compete in the Hunger Games, a televised competition that is a fight to the death. The Hunger Games features an ensemble cast, including Jennifer Lawrence, Josh Hutcherson, Liam Hemsworth and Woody Harrelson. Ender’s Game is a 2013 action, military, sci-fi movie that is based on the 1985 novel, of the same name, by Orson Scott Card. Andrew “Ender” Wiggin is recruited by an advanced military academy, to lead the fight in an alien invasion. The last invasion nearly put an end to the human species! Ender’s Game stars Asa Butterfield. The Host is a 2013 romance, sci-fi, thriller movie that is adapted from the 2008 novel, of the same name, by Stephenie Meyer (of Twilight fame). It’s completely different than the Twilight series, though, so if you’re expecting love triangles and epic romances, don’t. There is a romantic angle, but it’s not the center of the story. Melanie Stryder, a young woman who is infused with a parasitic alien, fights with the “Soul” over will control her body. The Host stars Saoirse Ronan. The Mortal Instruments: City of Bones is a 2013 action, adventure, urban fantasy movie that is based on the 2007 novel- City of Bones- by Cassandra Clare. Clary Fray discovers that she is a descendant from warriors, who are half-human and half-angel, that kill demons. The Mortal Instruments: City of Bones stars Lily Collins. I’ll be honest with you, the book was definitely better than the movie. Still, if you’re looking for entertaining movies like Maze Runner: The Death Cure that aren’t quite as deep and disturbing, this is a good choice. If you end up loving the movie, there’s an entire series on Freeform for you to binge on. Divergent is a 2014 dystopian, action, sci-fi movie that is based on the 2011 novel, of the same name, by Veronica Roth. It is the first movie, in a series of 3, followed by Insurgent in 2015 and Allegiant in 2016. Along with the Hunger Games, Divergent is one of my all-time favorite dystopian movies like Maze Runner: The Death Cure. I’m kind of mad that they just left the story dangling after the first half of the 3rd book. The final movie was supposed to release in summer of 2017, but after Allegiant opened to less than stellar reviews (and a cruddy weekend at the box office) it was canned. If you need closure as much as I do, keep an eye on Starz. They’re developing a series that should wrap up the movies then go from there. Of course, you can always read the books! They were even better than the flicks! The Giver is a 2014 sci-fi movie that is based on the 1993 novel, of the same name, by Lois Lowry. Jonas, who lives in a seemingly happy community, discovers the harsh realities of the real world, after he receives his assignment as the Receiver of Memory. The book is pretty much required reading for every dystopian fan, and the movie actually did a pretty great job of bringing it to life. When you start watching it, don’t adjust your screen. It’s supposed to be in black and white in the beginning! The 5th Wave is a 2016 action, sci-fi movie that is based on the 2013 novel, of the same name, by Rick Yancey. Cassie Sullivan is trying to save her brother, Sam Sullivan, after four waves of deadly alien attacks. Even if aliens aren’t really your thing, you should still check this one out! It’s incredibly good! The 5th Wave stars Chloe Grace Moretz and Zackary Arthur. With dystopian fiction enjoying immense popularity, it’s not hard to find movies like Maze Runner: The Death Cure! The hardest part is deciding which to watch first. If you haven’t seen The Hunger Games movies, I suggest starting there. What are some of your favorite movies like Maze Runner: The Death Cure? Share below!